Every business out there will tell you why they think themselves the best place to spend your hard earned money. We prefer to let our customers speak on our behalf. Jay is amazing and super helpful! I sent her a description of my horse and she recommended I try that one. When I had some minor fitting issues, she reviewed photos and recommended where to place some shims. She even offered to mail me a corrective pad if needed. The best part is their trial is 7 days, which really gave me the chance to try it in different situations (jump lesson, no stirrup school, trail ride, etc.) and ensure it would be right for us both. My mare and I both love the saddle. It’s not the softest/stickiest leather like the buttery French saddles, but for around $2,000, I have a saddle that propelled my riding to the next level and that I expect will wear like iron. Just purchased a used black country quantum from Trumbull Mountain. The trial policy is beyond amazing. I am giddy at how well the saddle fit me and my very hard to fit thoroughbred, even got the okay from my saddle fitter. I will be recommending TMN to all my horse friends. Ashley Marie Nauta — 5 starI just purchased a used dressage saddle from Trumbull Mountain. I live in rural Southside VA and don’t have access to local tack shops, so my saddle shopping experience was limited to online, with trials if offered. TM’s saddle trial policy is both generous and realistic. I had the saddle for a full 7 days and really had a chance to ride in it and feel it out before purchase. Rich and Jay were professional, responsive and great to deal with. The saddle was as advertised, in great shape, and they had answers to all of my questions. I’d recommend TM to anyone looking for a used dressage saddle. Paula Ruland — 5 starThank you so much, we’re having Christmas in May! Vita Taormina — 5 starAlways been very helpful and given expert advice… been a customer for many years now. Multiple saddles and been very happy. Just wanted to drop you a line about the new saddle. It took a few rides and a fitting by my saddle fitter, but I am loving my saddle now. It was an adjustment from the Summit which I also love. The Eloquence X is very comfortable. It has helped my dressage position immensely as my leg is now under me better and my legs do not stick as much. I was in show this weekend and for the first time I did not get a lot of negative comments about unstable position. I also feel like it gives me more access to Zoe’s back, maybe because I am sitting deeper. Seems remarkable you can feel her back through that leather but you can. It was a good idea to modify the twist. The saddle fitter thought the fit was perfect, just had to adjust the flocking. Zoe wears it without any shim pads. I really admire the craftsmanship in the saddle. You can tell it is very high quality. My fitter loves the panel leather as it so soft and luxurious. The Buffalo leather should wear well and I like that it doesn’t show the marks as much. Still getting use to the longer billets with a dressage girth but they are breaking in now so not as stiff. I used some of the Black Country saddle conditioning crème on them and they softened up well. My trainer who rides in it twice a week also is very positive about the saddle and she works with some very high end saddles in her daily work. So although it was a lot of effort to find the right saddle and get the fit right for Zoe and I, we got the job done and I’m a very satisfied customer. Thanks for all your work on it. Bonnie Gorichan, Supplied by Trumbull Mountain Tack Shop. I never thought I could love a saddle sooooo much! All the changes we made were perfect! You were absolutely right regarding the forwardness of the flap, if we had decreased it anymore it would have been too much it is perfect!!!!! I no longer feel like I have to pinch with my knee and have a death grip with my thigh to keep balanced in the saddle. I am in the balance sweet spot ALL the time no matter what my horse does! I have only ridden in the saddle twice but NEVER has a saddle fit like this before and it IS only the second ride! How amazing that is! I have two more horses that need saddles, I am saving pennies now for new Black Country’s for them! I can’t thank you enough for all your help I am absolutely blown away once again by the customer service I have received from your company and Black Country! In less then three weeks you had my saddle ordered EXACTLY as I ordered it and at my door! That has blown my mind! How could I possibly buy from someone else! I have been doing business with Trumbull Mtn since 2004 and you all have never let me down! You are the best and I count myself and my horses VERY lucky to have found you so many years ago! Don’t know how you did it Nancy but you did! 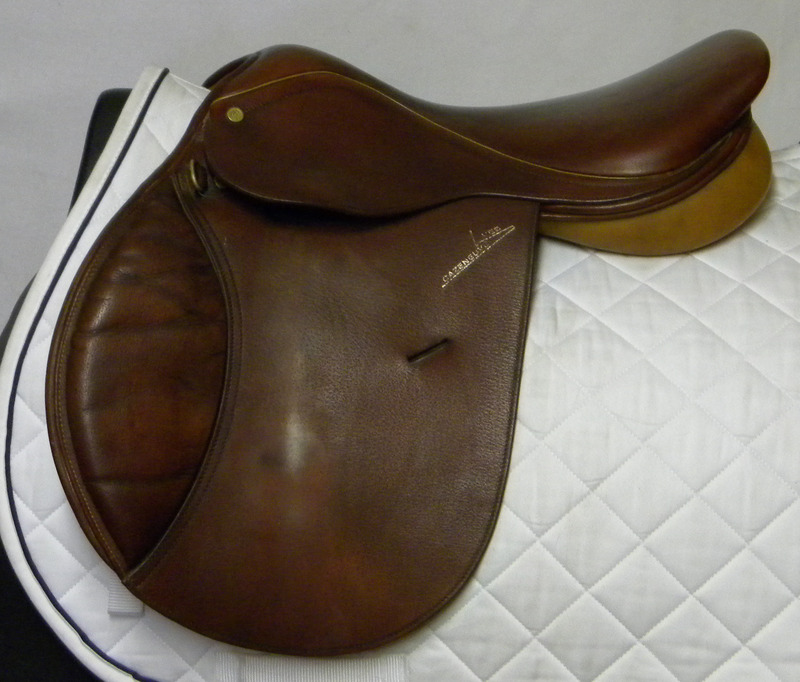 Can’t believe I have the saddle in my hands right now and it is beyond perfect! Absolutely Gorgeous! I worked with Trumbull Mtn and I love them so much I would consider giving them a kidney, or at least part of my liver. The very first saddle they sent me was perfect for my horse. I hated it, and it took 2 more saddles to find THE perfect one for both of us, but it was seriously and truly an awesome experience. So easy. The hardest part was just figuring out the closest FedEx shop to return the saddles I wasn’t keeping. As long as you send them a tracing that follows their directions exactly, you will get very good advice. They don’t even necessarily want to say “your horse needs X brand saddle”. They will tell you what features you should look for in a saddle, and they will make recommendations for you. And, they have a pretty large selection of used saddles so your budget likely won’t be a problem. Finally, they can keep an eye open for you for things that come in, so even if they don’t have the right saddle *this* week, they may next week! Send them tracings. It will probably cost you $10, which includes the cost of a stamp, envelop, paper large enough to trace on, marker, and the curvey wire thing to do the actual tracing (I got mine at a chain craft store), and the amount of online time you will spend emailing or calling back and forth. If you all ever need a testimonial to your professionalism at Trumbull Mountain, I’m your person. Dealing with you, (Nancy) and Edie was a pleasure. As I said previously, I had tried a saddle from another tack shop on trial prior to dealing with Trumbull. The difference between talking to a high school girl that likes horses (although, some know quite a bit but just lack the skill to deal with customers) to communicating with educated horsewomen was quite apparent. Kudos. My large pony I searched high and low to find something and finally resorted to getting help from Jay at Trumbull Mountain. Elizabeth TeSelle posted on Trumbull Mountain Tack Shop’s Wall. Kelly Hudyman. Kelly writes,”Here is a photo of me and my horse Conrad at an A rated show this past summer. We were reserve champion in the adult jumper division. Trumbull Mountain went to great lengths to properly fit Conrad …with a saddle. We both love our Black Country Ricochet. I get so many compliments on the saddle. It is beautiful and s…o comfy! I send all of these people to Trumbull Mountain as they have the best customer service out there. Thank you Trumbull Mountain…without TM I don’t think I’d have been able to compete on him last season. He was so uncomfortable in his back before finding the perfect fit. I live in Wisconsin, USA. I purchased 3 Black Country saddles from Trumbull Mountain Tack. 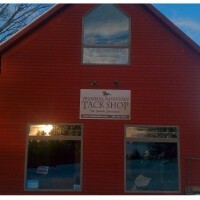 I am so pleased to find a great tack store thousand of miles away. The staff is excellent in saddle fitting via pictures and tracings! I love all my saddles and nothing has every come close to the quality and comfort. Its all I ride in. I just wanted to send a personal “thank-you” for all of your hard work. I truly appreciate everything that your company has done to help me in my saddle fitting journey. I find it’s rare these days to receive quality customer service, but not in your neck of the woods! Everyone has gone above and beyond my expectations…ten fold. First I wanted to note that you carry an excellent product. I recently purchased a Black Country Wexford. While it was love at first “site”, when I viewed it on the web; I found at first I preferred the Killington when I was sent the two on trial. They are both wonderful products, in my opinion. However, the pony’s back decided and the Wexford it was. I really wanted to say thank you to Kitt and Edie for answering my numerous emails and phone calls as to which saddle to choose and what options to pick. I know that I’m finally going to be very, very happy with a saddle. After spending over $5000.00 on a custom saddle, I have to say this…the comfort, the fit, the leather, (again, in my opinion), are far superior to that custom saddle. Black Country and the Killington are hidden gems. I want EVERYONE to know about them! Even my instructor and my pony’s chiropractor were very impressed with the Wexford. Second, the staff…truly kind, generous and thoughtful people. Always quick to respond to an email and take time to really talk to me on the phone. Thank you to Kitt for listening to my custom saddle woes and helping me get some ammunition in the situation. 🙂 Thank you Edie for helping me make the final decisions. And, thanks to the rest of you who answered the phone and gave me advice, settled my fears or told me “just one more day” until the Black Country shipment arrived. I’m happy to say that my saddle should be here in the next few days and I’ll be out of your hair, at least for a while. 😀 I am so excited to be finally able to ride again. And knowing that I’ll be doing it in the utmost comfort for me and my boy; it brings tears of joy to my eyes. It has been a long arduous journey, but I have learned this…when you want it done right, you go to Trumbull Mountain! Thanks again, from the bottom of my heart. You are truly the best. I wanted to take the tine to tell you how much I appreciate what you’ve done. I understand it’s probably your “standard” for everyone, but I feel you went out of your way to show me that my pony and I are special. And, we definitely feel special….. I just had to come here and publicly announce that I am abso-flippin-lutely in LOVE with Trumbull Mountain Tack! I’ve been to h-e-double hockey sticks and back in my saddle fitting journey, but it’s over! My saddle arrived two days and despite my burning calves from re-learning to how use stirrups after 6 months, I’m in heaven. It feels sooo good to have a saddle again. I ordered a trail saddle pad from them and we guessed on the size. It appears to be too large and it was a special order. What do they tell me to do? Take it out of the package and put it on my dirty, stinkin’ hairy horse and take pictures so they can see. If it doesn’t work? Send it back! From day one they have been super helpful in answering my excessively numerous, um, I mean, occasional emails and phone calls. All I can say is if anyone is on the fence about using them for a saddle purchase, go for it!!! They are 100 notches above top notch. Just plain nice and helpful folks. Thank you so much! I am really happy and VERY excited to ride him again!! He really loves his new saddle and so do I! One just cannot go wrong with a Passier!!! I want you to know that I really appreciate your professionalism and all of the hard work that you spent on Bentley and I. You have answered so many questions, and put up with my constant phone calling. I am truly thankful for your knowledge and leading me in the right direction!! Thank you for making my saddle fitting experience wonderfully beneficial and painless! You have been a gem to work with!!!!! “THANK YOU Edie and Nancy at Trumbull Mtn! You gals are the best ! Although we are on opposite sides of the U.S., doing business with you was as if you were right here in my hometown. Your service and support were of the highest standards and I know my new Frank Baines Working Hunter will be enjoyed for many years ahead. I had MANY frustrations during my year and a half search for a proper fitting saddle for my Paso Fino and I appreciate your sensitivity and patience with my mare’s special needs. Thank you so much for the wonderful experience my mom and I enjoyed while in your shop! I expected a small shop with a staff that were impatient and would treat me like a 5 year old. I was so surprised and delighted…I think half the fun of having a horse is shopping for it in shops like yours!! I will recommend you to all my friends that are looking for a saddle. I agreed with my mom when she said it was worth the drive. I really appreciated your way of doing business! Thank you for making saddle buying so enjoyable for my sweet Molly and myself. She is thrilled with her saddle plate that you so kindly sent! Again, thank you so much for making my new saddle such a success! I’ve never had a saddle fit me so well and it’s so beautiful. It’s been a pleasure. Thank you for being so nice to me. I will for sure give you all of my business that can be done by mail in the future. I am a firm believer in being loyal to those who treat their customers well, and you have exceeded my expectations! Thank you for the generous value on my saddle. I am so sorry to report neither saddle fit our horse so I am returning them this a.m. BUT THANK YOU SO MUCH FOR THE VERY BEST CUSTOMER SERVICE ON THE PLANET — YOU PEOPLE ROCK!!! Many many thanks for a job extremely well done!~! I just wanted to thank you all for my great shopping experience! You are knowledgeable, patient, helpful, and you actually listen. Plus you all were so nice and friendly! I work in an industry where good customer service is crucial, and you by far are the best I’ve every seen. Your customer service is consistently great every time I call. I feel like I’ve made new friends! AND, I love my Black Country Equinox!!! Your saddle trial policy is excellent, and allowed me to find the right saddle with a no grief! What a concept! We are on opposite coasts, but you make it seem like your shop is just down the street. I am referring all my friends to you. Thank you so much for everything! Marci, I also want to thank you for your thoughtfulness and helpfulness…that’s what makes for return customers. Wow Kitt! Talk about going the extra mile! Thank you so much! Trumbull Mountain is without a doubt the #1 tack shop in the good ole US of A. Everyone there is extremely knowledgeable, a real joy to talk to, appreciative of current and prospective customers, with endless patience and understanding. One day I plan to make a trip to Vermont to meet all of you. I’d gladly travel a greater distance than that to thank you exceptional gals for helping me with my horse equipment. Trumbull Mountain is the ONLY tack shop where the staff rides in everything they sell. Out of all the tack shops I’ve contacted in the past 2 years (and there were many), no one could tell me how the saddle would perform on the trail, the comfort of it for horse and rider, or be honest about the fit and how it’s made. I’m sure you are aware of all the mediocre saddles being sold to unsuspecting horse owners that are pricey and of poor quality. The companies have one thought in mind “the almighty dollar”, whether the horse comes up sore or lame, or the rider gets hurt is of little concern to them. I RAVE about Trumbull Mountain, and praise all of you gals. As some of you may recall, I was on what seemed to be an endless saddle search for Safi, my wide, short backed Icelandic. After many demo’s (search the archives under my name if your looking for reviews) we ended up with a Black Country Equinox from Trumbull Mountain Tack in Vermont. IT ARRIVED! And it is better than my expectations. We had a perfect ride yesterday. Safi (who can be pokey at times) moved out better than he ever has. I attribute that to the great fit, (we got the x-tra wide tree) and to the close contact you get with a mono-flap. Keeping a centered seat waseffortless, The narrow twist lets my legs hang comfortably underneath me (rather than being splayed out to the sides, as with every other saddle I tried), so I could actually give leg cues. I worked with Nancy who answered every question and understood my concerns. These saddles are expensive, and I don’t spend that kind of money lightly, so I was really a pain in the #$%! but everyone I spoke to at Trumbull Mt was knowledgeable and helpful. Not everyone could afford one, but if you can manage it, it is well worth it. I splurged and bought the Equinox II, (had to sell my Vespa scooter to fund it) but I got exactly what I wanted. Oh, and did I mention it’s beautiful, I was just going for a great fit so this is just a bonus. Thank you all for your advice and help in putting us in such a fabulous saddle. Thank you for all of your help on my recent purchase. I worked primarily with Nancy, and she was positively AWESOME (through everything – credit card issues, where to ship to, etc). I am so glad that the County Stablizer I ended up purchasing this week from you guys fit my horse and I…it was a long road saddle hunting! I would, and have, recommended Trumbull Mountain to anyone looking for a saddle. Everything about the store is great, from the generous saddle trial, to your customer service and discount if you purchase a saddle! Many thanks Sara for your assistance with my saddle shopping experience. I certainly loathed the thought of having to find another saddle for my mare Gracie but your guidance and the Trumbull Mountain’s generous saddle trial policy made it much more enjoyable experience for us both. Whatever one spends for a saddle, I cannot tell you how important it is to be able to have the time to ride in saddle Most places only give you a couple of days at best and then you have to hope your work schedule or weather conditions cooperate if you do not have an indoor ring. If a person has a hard time trying to find a saddle (new or used) to fit themselves and their horse, I will definitely recommend Trumbull Mountain!! This e-mail is to let you know that I am keeping the Amerigo Cervia (#9478) that was sent to me earlier this week. It fits GREAT and I love it! Thanks for all your help in the purchase of this saddle. I was at first skeptical about dealing with a tack shop over the internet and from half-way across the country, but you guys were fantastic. You have my confidence vote and I will be a repeat customer next time I am looking for a saddle. Thanks for the delay in shipping the saddle out so that I could be home from vacation when the saddle arrived and have the week to try it out. Of course it only took me two rides to determine that it was a keeper. I would like to take this opportunity to say “Thank You”. I love my saddle and all the fittings and I also appreciate your very professional, efficient and personal service. I will certainly be happy to do business with you in the future and have no hesitation at all with referring business your way. I have received the Prestige dressage girth, which, by the way, is beautiful, and will be able to try it tomorrow. If I’ve guessed correctly on the size this time, I’ll be returning the leathers and the humane end girth on Monday or Tuesday. Crimson and I are sssoooo very pleased w/ his new Equinox saddle. I cannot thank you enough for your patience and diligence in your efforts to create a saddle that fits both of us. What a concept–deceptively simple, but, oh so elusive. The Skito pad is also wonderful, but I won’t use it until the flocking in the saddle has molded to his shape. With his new cantle stowaway pack, we’re all set, and I am anticipating many many happy hours in the saddle. Thank you thank you thank you. Several people at the barn are intrigued by the Equinox, so don’t be surprised if you receive more calls from Oklahoma. Nancy, I just want to tell you how very impressed I’ve been with all your help and kindness. It’s a rare thing to find these days. I’ve been keeping the friend I ride with up to speed on how the saddle hunt has been coming along and she’s been mighty impressed too. She told me one day, “Wow, I can’t believe how helpful the folks at Trumbull Mtn. have been. You won’t find anyone down here like that.” And just yesterday, she commented, “The Trumbulll Mt. folks certainly are patient and helpful. I would like to do business with folks like that.” I thank you from the bottom of my heart for all you’ve done the last few weeks. Shopping for a saddle isn’t easy and anyone who’s been through the aggravation for years such as I have, greatly appreciates finding a quality, well-fitting saddle, and considers it a pleasure to do business with a company like Trumbull Mountain that not only stands behind what they sell 100%, but also treats every customer with the utmost respect and courtesy. In short, it’s worth the wait! I just wanted to thank you and the staff at Trumbull Mountain for all the help in selecting the Duett Largo. It’s a great saddle for both Mys and I. Our equine chiropractor was really pleased with the fit and you guys were great about the trial period so I could get her input on the saddle. I was really hoping for a good fit for her, especially as a still growing 5 year old, but I’ve had great results with the saddle as well. The back pain I had riding in my old saddle and the other saddle that I trialed from a different company has disappeared since riding in the Largo. I can’t tell you how refreshing it was to speak to people who actually understood and used the products that they were selling, both for the saddle and for the fittings I later bought. I’ve passed your name and website along to several other people, and I hope nothing but good things keep coming your way. I do have one more favor to ask- if I could get a final receipt/accounting of all my charges for saddles, fittings, and shipping, my accountant and I would both be eternally grateful. Keep up the good work and thanks again! I just wanted to send a heartfelt thank you for everything your tack shop does for riders looking for new saddles. Your personal service and friendly approach is greatly appreciated during what can be a very stressful and unsure time when looking for a saddle. I have found a saddle through another service but I had no person to person contact and it made me only wish that I had found my new saddle through your company. So thank you again and if I am ever in the market for another saddle I will be looking at your website first. Thank you so much for all your help. You’re the best. I cannot tell you how much I appreciate your cheerful cooperation, patience and willingness to ensure my horse and I are comfortable. Your company has been delightful from the start of my quest for a new saddle over a year ago and I have, and always will, highly recommend you to anyone on the hunt. Other saddle sellers have so many restrictions and rules for trying saddles, it is almost impossible to make an informed decision without feeling pressured, hurried and required to test ride a saddle under unnatural conditions. I think all saddle makers should be beating down your door to get Trumbull Mountain to rep their brand. I’ve seldom worked with such a service-oriented, conscientious, helpful, go-beyond-the-call group. The level of service you provide is increasingly rare, and I am grateful. Hi Nancy. You sure know how to pick em. The Eden is lovely. I have never felt so secure in a saddle. And I think my old schoolmaster mare really likes it too. I am grateful to you for your interest, expertise, and advice. Thanks Nancy for picking out a terrific saddle! Saddle is great and I am looking forward to getting a lot of use out of it. I got to ride in it only once so far and it amazes me how much happier he is. Go ahead and charge my card. I did not realize that you did not do that yet. You guys are the best and I can not thank you enough for giving the best trial anyone could wish for and for your expertise in fitting horses. It has been an absolute pleasure and I wish you all the continued success. Even though I am now a huge fan of Black Country, I am a bigger fan of Trumbull Mt. Tack! I got a check in the mail yesterday, and I wanted to extend my thanks to you and the shop for doing a great job selling my Isabel saddle and also with the saddle I ended up buying from you last year. The staff at Trumbull knows the stock and how to fit a saddle and obviously other customers have confidence in that expertise also. I have already raved about your services. Thank you again. Bronwyn thought you were amazing and really appreciated all the time and help you gave her. She said it was so wonderful to find that kind of customer service in this day……. She’s very nice and you made her very happy!